First on the First 5K sells out every year…and 2013 was no exception. Whole families run and walk the event together. Friends drag each other off the couch to start the year off right! The energy is both excited and anxious. What a blast! A new course kept us mostly off the main roads, and thankfully off the concrete sidewalks I remembered from last year. Starting from the Westerville Community Center, rather than Ohio Health, allowed for plenty of parking too. The city and the race crew did a fabulous job getting the trail and the road clear after a fresh layer of snow fell the night before. I was scheduled to pace the 38:00 finish with my favorite buddy, which works out to roughly a 12:14 pace. My son (age 9) was also running the event, and he would join us for most of the race. As I’ve said before, pacing has become a real passion of mine. I love to give back to my running community, and pacing is one of those things that is rewarding to both parties. I have found that people in the slower paces groups appreciate having a friendly face that can encourage them to the finish, maybe more so than the faster groups. I’ve been there too. Everyone has to start from somewhere. And it’s thrilling for me to watch that person achieve their goal…and let them “beat” me. It was a little chilly (28*) with a slight wind, but the scenery could not be more spectacular. The race started off without a hitch, and 1,000 people took the first steps of 2013 toward health. After a quick section on the main roads, we took to the Westerville Bikeway. The only issue came as we looped the soccer fields in the last mile due to the wind whipping across the open space. We ducked our heads, pulled our layers a little closer and made it together. We crossed the finish line right on time. I knew my son was just behind me, so I got my camera out, and snagged a medal from one of the fabulous volunteers at the finish. What a moment for me…to put that medal around his neck! Then on to the food. This year, Yabo’s Tacos provided pork tacos with all the toppings for participants. Yum (minus the pork for me)! Plus a new water bottle from Ohio Health, a medal, and a long sleeve tech shirt. And don’t forget the Snowville Chocolate milk! Did you run a New Year’s Day race this year? What are you doing to stay off the couch this year? 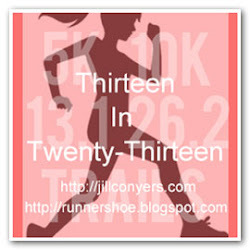 This entry was posted in Race Recap and tagged Events, Health, Lifestyle, Running. Bookmark the permalink. Sounds like a fun race. And Snowville chocolate milk is the BEST! I love your thoughts on pacing… I’ve always found pacers to be the kindest, most inspiring people – I’d love to be one some day 🙂 …And being able to present a medal to your son?! What an incredible moment. … It may be presumptuous of me (especially coming back from an injury! ), but my goal for this year is to work toward and achieve another half-marathon PR.